Important Cycle Lows Due In October Or ??? It will help you understand my wave counting method. For those that may have missed something, this is the 4th blog update in the last 6 days. Before I get to the promised cycle stuff, here are couple of charts and comments about the current decline. A downside fan that has shown some resistance to the lines. An upside fan that has shown some resistance to the lines as the market declined. 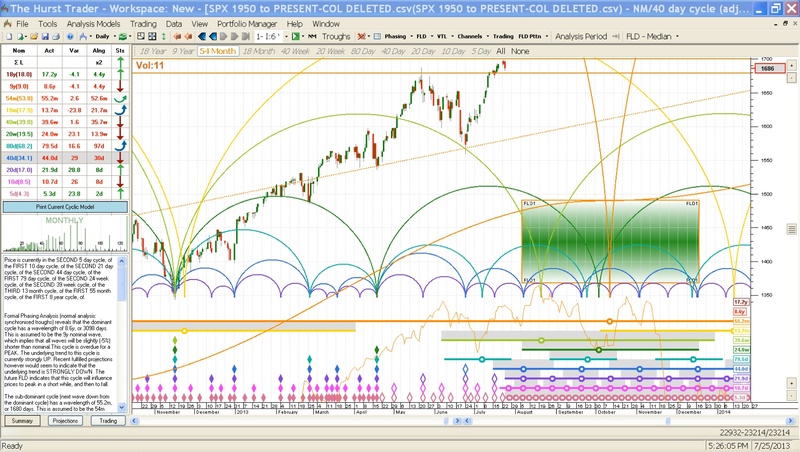 Here is a possible wave count with upside projections. Naturally these projections are trash if all we are doing is tracing out a lateral upside move from the recent bottom. A longer term upside fan, since the June 24th bottom, showing resistance at the lines. Another downside fan with resistance to the lines. The daily charts below indicate that since the June 24th low, we could have one more push to new highs in both the SPX and the Dow to complete a 3 count. The next chart shows that we are in the area of the upper limits of the megaphone formation. 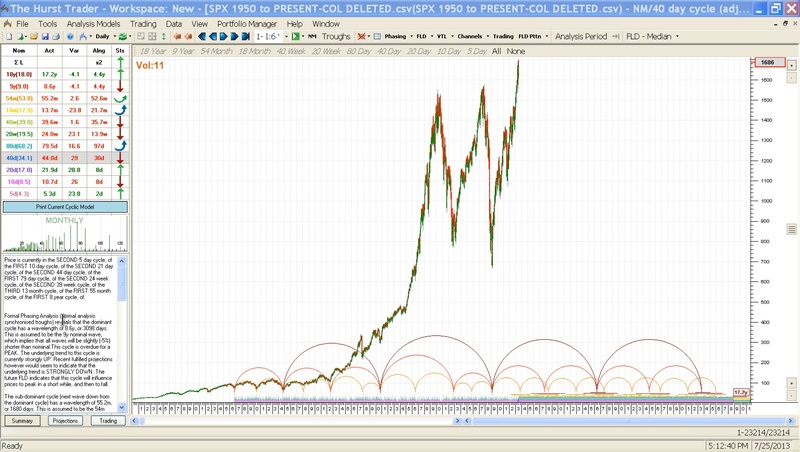 This formation has been unfolding since the 2000 peak. Before my blog, I emailed friends about my stock market thoughts. The following email was dated March 5, 2009. 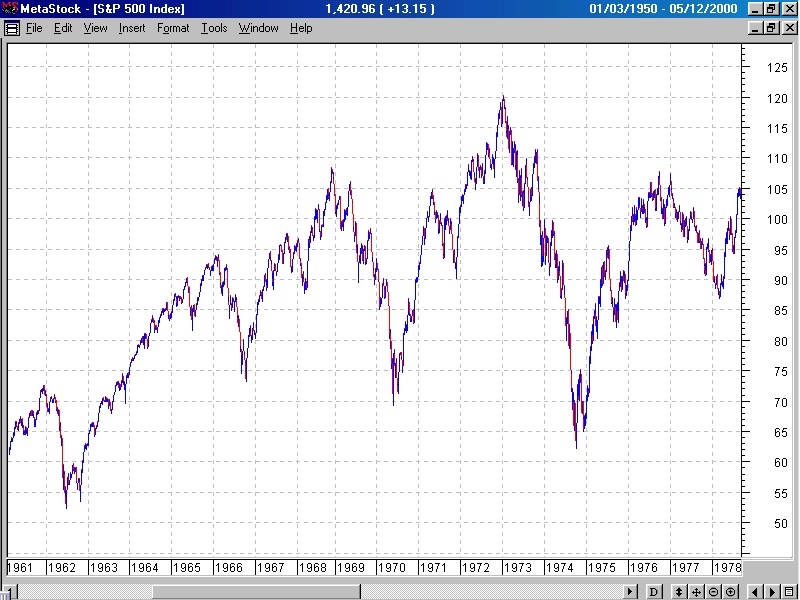 “The below graph is the period 1961 to 1978 for the SP 500. Notice the three peaks and three bottoms on this chart. The chart looks like a horn with higher peaks and lower lows. If you lay a straight edge on the 3 bottoms, you’ll find they almost line up perfectly. The Dow Jones Industrials chart of the same period did line up exactly. I believe we could be in a similar situation presently with an identical chart formation. This supposition that we could test the upper limits of the megaphone formation if everything went right was kind of far out in 2010 with the SPX sitting at 1123. Since that time, SPX has risen to almost 1700, an increase of 51%. In the above phrase, “The chart looks like a horn with higher peaks and lower lows“, I later began calling the horn a megaphone formation. Megaphone is what Magee and Edwards called this type of formation and I adopted that name after August 2010. I applied it to the present expanding formation, and also for the period 1966 to 1974. Contrary to some beliefs, Edson Gould never called the period 1966 to 1974 a megaphone formation. I subscribed to his market letters during that period and he never used the term megaphone formation to describe this period. This error arose from a misunderstanding from an email I wrote to a very good market analyst. I had written him about some of Edson Gould’s great market history. In the same email I called the present period as a possible megaphone formation similar to 1966 to 1974. He misunderstood that it was my use of the term, megaphone and not Goulds. And so began the fame of the Edson Gould Megaphone Formation. Funny how things can happen. I never corrected him because it wasn’t important. Sadly it matters even less today. “We have entered a wide swinging market similar to that of 1966 to 1974. During that era we had three bear markets with 2 intervening rallies. Each bear market had a lower low than the prior bear. The intervening rallies saw new all time highs before the next bear market began. Two years ago we were at 12,000 on the Dow and now we are knocking on the door of the upper limits of the megaphone formation and at all-time highs near 16,000. The following is an inflexible cycle chart (unlike the Hurst cycle software) using StockChart tools, but it does appear interesting. You’ll see how it roughly matches the Hurst cycle update that follows, showing an peak soon and a bottom in late December or early January. Later this year (October to January) we have some important cycles bottoming. The bottom will include, the 55 month cycle, 14 month cycle, 39 week cycle, 24 week cycle, 80 day cycle, 44 day cycle, and 21 day cycle. 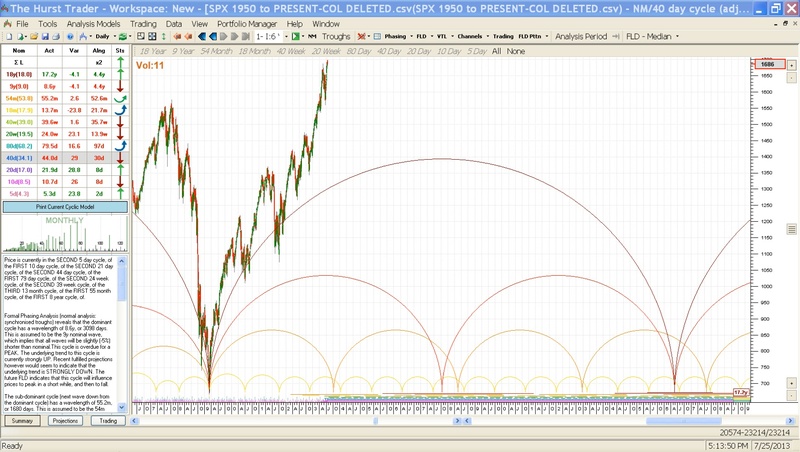 The last time the 55 month cycle bottomed was in March 2009. That was a biggie, but the largest cycle bottoming on that date was an 18 year cycle and that has continued to dominate this stock market. The 18 year cycle won’t peak until the next time the 55 month cycle bottoms (about 2018). After that the 18 year cycle will be on the down slope. 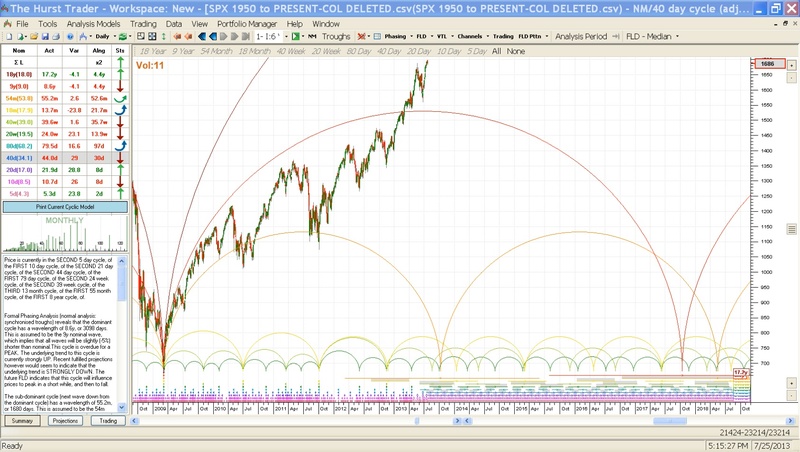 In 2009, the 55 month cycle took a back seat to the longer cycles. But coming this October, the longest cycle bottoming will be the 55 month and it’s going to be the top dog on this occasion and exert its dominance (maybe). BUT . . . Since the 55 month cycle crested about 2 years ago and has been falling, it has been unable to exert any downward pressure on the market until now (???). This means there is a longer term cycle that is still dominating the 55 month cycle. That’s very interesting and shows the “possibility” that the bull market isn’t going to die this year (3 cheers for that prospect). This late downward effect of the 55 month cycle low is called right side translation and is always present during a good bull market. Note that all of the above cycles mentioned will be bottoming at the same time (Oct – Jan). This is dictated by Hurst’s Law of Synchronicity, which states that waves in price movement are phased so as to cause simultaneous troughs wherever possible. I don’t like the part about “wherever possible”. It seems to me they bottom simultaneously, it just takes some adjustment to figure it out. Sometimes it’s easy and other times, it isn’t obvious until much later. The Principle of Proportionality states that, waves in price movement have an amplitude that is proportional to their wavelength. In other words, the longer the cycle, the wider prices will oscillate (lower or higher). Cycles don’t have fixed time lengths. They vary over time and this can make understanding cycles a heard scratcher. The Hurst software calculates this for you automatically. For instance, the 18.0 year cycle is actually running at 17.2 years currently. Following is the nominal cycle length followed by its actual cycle length. The most informative chart for the immediate future is the last chart. The others are history and long term predictions. An overview of the cycles since 1950 to 2053. This is a “rough” outline of the future and past. Projections for the market since 2007 to 2029. Notice the largest cycle crests in 2018. Maybe that will be an interesting observations in the years to come. We’ll see what happens. Cycles from 2009 to 2018. Notice that there is always a bunch of cycles coming down at the same approximate time (2018). This is how Hurst’s Law of Synchronicity working. They will all be defined at one point when the cycles bottom. A closer view of the cycles from October 2012 to January 2014. 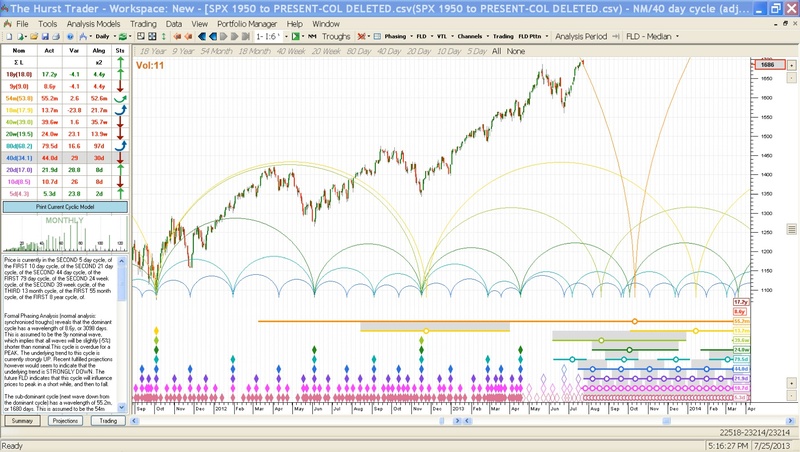 Most of the cycles are indicating an October bottom, but the 14 month cycle is indicating January 2014. 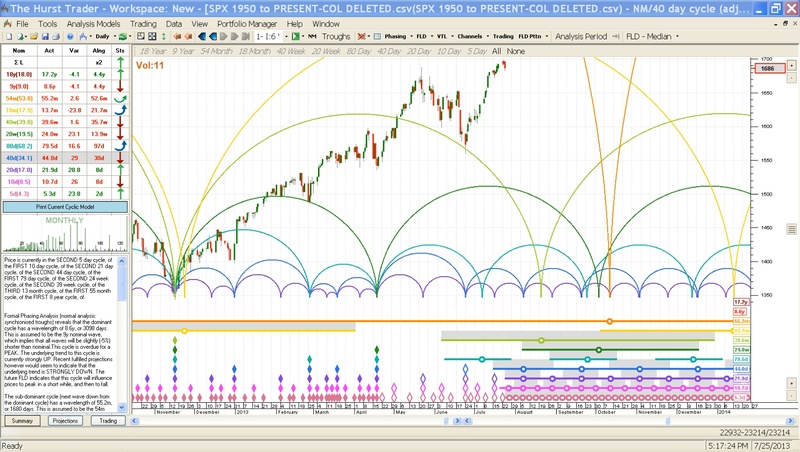 All of these cycles will line up on one date (after the bottom) and won’t be spread out as shown presently. This chart is the same as the one immediately above, but I turned on the 54 month projections in the software (I had mentioned there were more bells and whistles in the Hurst software and this is one of them). It’s indicating a bottom somewhere from SPX 1700 to 1370. We’ll see how all of this plays out in reality. One nice thing about this software is that it keeps modifying its projection based on reality, meaning as we move forward towards the cycle bottom and things are not going according to the original projection, it will changes its predicted outcome. We are relatively close to the Oct-Jan time frame and there isn’t likely to be much in the way of adjustments. There have been past instances where the uptrend was so strong (due to a larger cycle’s influence) that a projected bottom of significance turned out to be a non-event. When this happens, the software will mark a tepid decline as the cycle bottom. In one recent occasion that this actually took place, the market took off even stronger than it had before. This seems reasonable because the cycle bottom was past and the current downward influence was over for the moment. It’s the dominance of a larger cycle that comes into play and truncates a smaller cycle’s bottom. I’m not saying that is going to happen this time, it’s just a history lesson. In fact, I believe that we will have a significant cycle bottom in the 4th quarter. How significant will be the interesting part. For anyone interested in charting Hurst Cycles by hand . . . it’s time consuming and a LOT of work, but when executed properly it will usually reward you with profitable transactions (if you do it right). In order to chart by hand, you will need the “CycliTec Services Training Course”, which was reprinted by Traders Press Inc. as the “J. M. Hurst Cycles Course”. It’s a long course with approximately 1200 pages and includes audio lessons. Charting the Hurst cycles by hand, I’ve been there, done that. I wound up not keeping the cycles up to date because of the work involved. When I fell behind, I missed some important market bottom dates. Those errors cost me money and that’s definitely not the path to success. So you must have the time to dedicate to charting the Hurst cycles. Without this time, don’t waste your money on the course. But there is an alternative to time consuming hand charting, Hurst Software. The software to generate the cycles is a little bit expensive, excellent on projections, error free, and recommended. Since it ain’t cheap, you better be serious about making money in the market. But the return on your money should be worth the investment in the software. I have NOT taken the FLD workshop and can’t testify to how well it works and whether it’s worth the extra money. I do find FLD lines to be very interesting and they frequently work quite well in giving fairly accurate measurements for a projected bottom or top, plus they also provide insight to possible resistance levels. Apparently the FLD workshop provides some new insights into FLD that Hurst may have missed. Maybe they’ll offer it to me gratis and I can tell you first hand all about it. That would be nice but I’m not holding my breath. The software automatically generates all of the bells and whistles that Hurst developed, plus a few more that the software author has added. The data file I use for analyzing the SP 500 cycles is downloaded from Yahoo Historical Quotes and saved in comma delimited format.